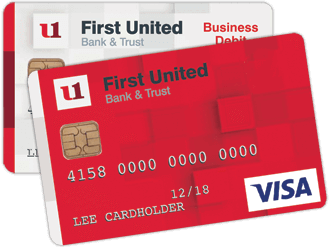 Our personal and business debit chip cards feature an embedded chip that improves security every time you make purchases at chip-enabled terminals. You get enhanced fraud protection with chip technology. This tiny chip protects you from fraud by creating a unique code for each chip transaction. This prevents card data from being fraudulently used. As more stores and restaurants around the world are using chip card readers, you can use your card in the U.S. and abroad with even more confidence. 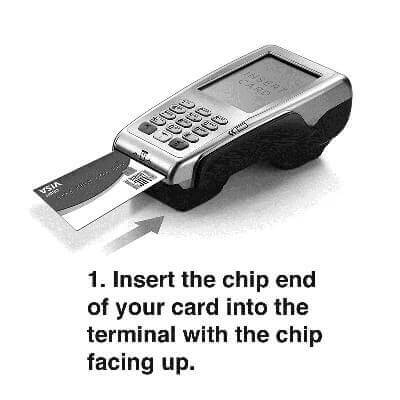 If a merchant hasn't switched to the new chip card reader, don't worry! 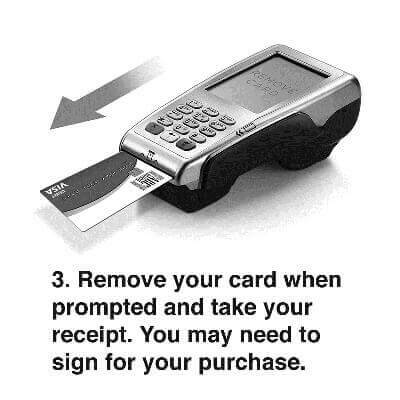 Your card will still have a magnetic stripe for use at traditional retailers. For online and phone purchases, you can continue to place orders the same way you do today! 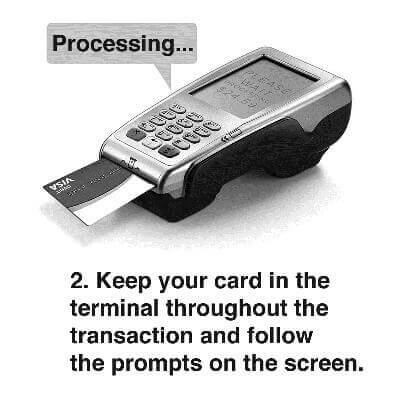 Plus, it's easy to pay at chip-enabled terminals! Please sign your card upon receipt. Memorize your PIN. Do NOT write it on the back of your card or keep it with you. Never disclose your PIN to anyone. Keep a written record of your PIN entirely separate from your Card. Remember to pick up your ATM receipts before leaving the ATM. Be alert - look around the area. Leave immediately if you see or sense anything suspicious. Always have your Card in hand, ready to use. Allow a comfortable distance between you and the person using the ATM. Respect any line barriers that say “Wait Here". Do not walk up to the ATM before the current user has left. Use your body to shield the ATM's keyboard from another person's line of sight. Don't stop to count the money or expose it for others to see. Place all money into your pocket or purse immediately. Remain alert - watch for strangers who may approach or follow you. Keep safe distances between you and others. If someone follows you, go to the nearest populated place such as a store or restaurant. Do not reveal any information about your Card over the phone. Verification of your Card account(s) and PIN should only take place in person at your financial institution. If you receive a call about your Card, contact your financial institution immediately and we will suggest the next course of action. Call 1-888-692-2654 to report a card lost or stolen. During non-business hours, you may also call 1-800-236-2442. The non-business hours telephone number noted above is typically used only for reporting the cardlost or stolen.